How Solomon Islands could serve as a model for protecting small Pacific Island nations from the effects of climate change. On April 3, 2014 a tropical storm named Ita stubbornly hovered over the island of Guadalcanal in the Western Pacific. In fewer than 12 hours, Ita dumped more than a meter of rainfall on the island. Rivers overflowed their banks with mud and debris causing flash flooding from the mountains to the sea. In Honiara, the Mataniko River cut a new and destructive path through villages, carrying away homes, women and children. Out in the eastern portion of the country, the rivers pushed mud into remote villages, destroying their food gardens and fouling their water supply. In the western part of the island the torrent of water tossed cement bridges around like building blocks. By the time the carnage was over, Ita was responsible for at least 21 deaths, more than 30 missing, hundreds of homes destroyed, and in excess of 10,000 people displaced. The municipal water system was disrupted and what was available was contaminated by river water and sewage, making it undrinkable. Honiara, the capital of Solomon Islands, sustained serious damage to its bridges, roads, electrical services and water conduits, dealing a serious blow to its fledgling economy. Infectious disease outbreaks among residents began within 36 hours of the flood. 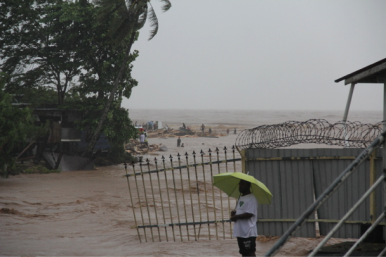 Ita was one of the most severe weather events experienced in Honiara’s history. And while it may not have been a cyclone (at least at that point), the effects were no less devastating. This will not be the last major weather event experienced by a vulnerable small Pacific Island nation like Solomon Islands: extreme weather events are projected to increase in frequency over the next 20 years. The irony of the storm is that it came one month after the USAID and the World Bank initiated climate change adaptation programs in Solomon Islands. The World Bank funded a $9.1 million grant to the Community Resilience to Climate Change and Disaster Risk in Solomon Islands Project (CRISP) and the Global Facility for Disaster Risk Reduction and Recovery Grant/ EU- Asian, Caribbean and Pacific (ACP) Natural Disaster Risk Reduction Program, to be used to strengthen the country’s response to climate and disaster risk. USAID along with with Deutsche Gesellschaft für Internationale Zusammenarbeit (GIZ) pledged $1.5 million to be used in the Choiseul Province of Solomon Islands for climate change adaptation. These are excellent programs that are greatly needed in these vulnerable regions. Natural disasters are not new to Solomon Islands. In 2007 and 2013 earthquakes and tsunamis killed more than 50 people in the western and remote Temotu regions of the country. Every rainy season, mountain rivers bloated by heavy rains wash out coastal roads and small bridges. They rip through gardens, homes and schools. These infrastructure disruptions have enormous cumulative social and economic consequences, especially in countries like Solomon Islands where there is little to no margin for economic error. This includes the personal economic impacts the average resident experiences as they rely on subsistence living through coastal fishing and food grown in their gardens. Health impacts following storms like Ita are detrimental to families, education and workforce productivity. The secondary disaster caused by the flood is already underway in Honiara and its outlying communities with cases of infectious diarrhea, dysentery and worsening of the already existing dengue outbreak. Without shoring up the response by health systems these infectious outbreaks can contribute to premature death and disability. The World Bank’s news release announcing it’s Solomon Island Climate Control grant stated “Based on Pacific Risk Assessment and Financing Initiative (PCRAFI) modeling, the country has a 50% chance of experiencing an event causing loses in hundreds of millions of dollars, and casualties larger than 1,650 people.” While Ita may not have proved to be as deadly as this model predicts, it has generated a great deal of damage and in doing so she is a warning of what can happen in a vulnerable South Pacific urban area, like Honiara. USAID/GIZ and the World Bank funds awarded to Solomon Islands may best serve the country now by being diverted to assisting in thoughtful infrastructure rebuilding in the damaged areas. In Honiara, mitigation of a repeat of the current damage should include consideration for strategically placed embankments and levees, or the creation of intentional sloughs to control flash flooding. Reconstructing bridges and roads and making them more durable will keep commerce and goods moving even in the event of a significant storm. New homes to replace those destroyed by Ita should be built away from flood plains. The Solomon Island government, in particular the Ministry of Forestry, must rethink its current deforestation and land use policies in order to minimize storm runoff by allowing reforestation to catch up with and exceed current timber harvest rates. Ita has been a powerful and deadly wakeup call for Solomon Islands and for all Pacific Island nations. Unfortunately these vulnerable countries bear a disproportionate risk of climate change weather impacts while contributing very little to the greenhouse gases that cause them. Thoughtful development and rebuilding to counter these vulnerabilities may be their best climate change strategy while they wait for those of us in developed countries to reduce our carbon footprint. With the current funding from USAID/GIZ and the World Bank, Honiara could very well become a model of how to rebuild a coastal urban area to maintain sustainability and safety, despite global warming and climate control changes that are beyond the control of its people. Eileen Natuzzi, MD, MS, FACS is a public health surgeon and director of surgical education for the Solomon Islands Living Memorial Program, an educational partnership between health providers in the U.S., Australia and Solomon Islands. Mudslides Make a Mess in Central AsiaEl Niño and Southeast AsiaAsia-Pacific Population Growth and the UN Post-2015 Development AgendaYour Guide to the UN Climate Change TalksClimate Change: Glimmers of Hope?